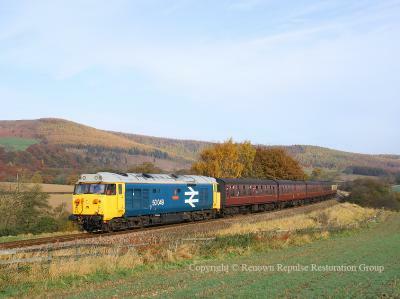 50049 near Battersby in November 2007 The North Yorkshire Moors Railway staged the "Valley aid" benefit gala in November 2007 to raise funds for the repair of the Severn Valley Railway which had been severed by flooding and embankment slippage at the time. 50049 attended and operated trains on the Esk Valley branch between Whitby and Battersby. The train is seen near Battersby on 4th November 2007. 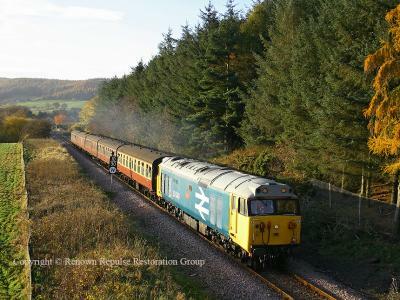 The North Yorkshire Moors Railway staged the "Valley aid" benefit gala in November 2007 to raise funds for the repair of the Severn Valley Railway which had been severed by flooding and embankment slippage at the time. 50049 attended and operated trains on the Esk Valley branch between Whitby and Battersby. The train is seen near Battersby on 4th November 2007. 50049 Kildale Common November 2007 On the same day and event as the previous photo, 50049 is seen at Kildale Common. 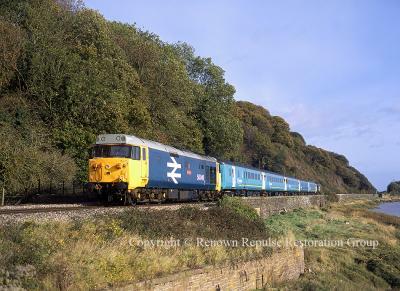 On the same day and event as the previous photo, 50049 is seen at Kildale Common. 50049 top-n-tail with 50031 between Chepstow and Gloucester One of the most active of the mainline performers is Class 50 Alliance-owned 50049 Defiance seen with 50031 Hood tailing, the pair are passing Gatcombe near the site of the old Severn Railway Bridge on the Gloucester-Chepstow route. 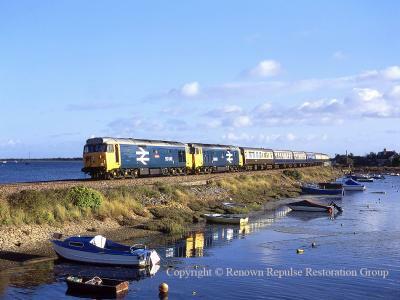 One of the most active of the mainline performers is Class 50 Alliance-owned 50049 Defiance seen with 50031 Hood tailing, the pair are passing Gatcombe near the site of the old Severn Railway Bridge on the Gloucester-Chepstow route.